Last weekend, I had the unfortunate accident in which my leg got caught between my car door and the body of the car. Worst of all, the door had momentum as it closed because my car was on a hill. Needless to say, my calf bruised to approximately 3 inches by 2.5 inches diameter. But, the bruising was not as discolored as I would have imagined it to be because of the injury to my leg. I attribute this to Reiki. As a Reiki Master, when I get injured I make sure that I give that injured area Reiki to aid in the body’s healing process. After my leg was slammed by the door, I made sure that I gave myself Reiki. On the next day, my leg did ache when I walked. This is a sure sign that Reiki is not magic, but…I do not want to imagine what it would have looked like or felt like when I walked if I wasn’t able to give myself additional healing. After one week, my skin is slightly discolored and the area is still a bit sensitive. I will have Reiki given to this area tomorrow and I’ll tell you how quickly my leg changes back to normal. I came across the concept of “Witnessing” when I completed the Summer 2011 Meditation Challenge through the Chopra Center. I found this activity beneficial for me. It helped me decompress and slowed my mind before I went to sleep at night. The concept: Imagine that you are another life being from different planet. You don’t know what a human routine looks like, what actions are acceptable, what is not acceptable. You cannot hear what others say, nor can you feel emotions or be empathetic. You can just watch the actions of others. If you were this other life being and were watching yourself in your daily activities, what would you see? The activity: Take 5 – 10 minutes in your day- but I prefer right before I go to sleep. Pretend you are watching a movie of your day with the mute volume on. Begin seeing yourself awake, go through your day until you see yourself in the middle of this “witness” activity. Lastly, be sure you watch your day in fast forward. (Fast forward will give you a quick shot of your day, so you don’t spend time re-living the emotions connected to the actions)…Remember, you don’t feel emotions as another life being, you can just watch. The result: Your mind will begin compartmentalizing and storing this information into your mind. You will be able to accept and let go of the encounters that you had during your day. Lastly, (my favorite) you can evaluate your day to see if you spent your time outside of work doing the most important priorities in your life. For example, after “witnessing” I ask myself, “Did I watch myself spend my non-work time balanced between my loved ones, myself, and a few chores? Or did I spend too much time on one and not enough time on another? Knowing the answer to this, I become aware of whether I like how I’m spending my time and change my life if I don’t like what I see. Try it. Although your day may be filled with monotonous routine, it will help you realize that your day is filled with productivity and should be filled with things you cherish most. I highly recommend learning about anatomy and physiology. Learning about receiver’s problem areas and symptoms will help you provide a better treatment to the receiver in hopes of a faster recovery. Before I begin Reiki treatments, I ask if there are specific areas that physically ache or are giving the receiver pain. When they tell you physical areas or organs, such as lower back, deciding your locations is easy. However, the receiver may tell you symptoms or an event that they are struggling with such as; troubles sleeping or trying to quit drinking. Taking the above examples, if a receiver mentioned troubles sleeping, I would work on their head region because the pineal gland and hypothalamus located in the brain are major organs connected with sleep. Those would be two locations where my time would be dedicated to. The locations for quitting drinking; I would dedicate my time to treat the liver, kidneys, and other organs of the urinary system because they are the main organs connected with water balance and clearing toxins from your body. Please research more about the human body and common diseases that affect normal health. It will benefit yourself and those that you treat. Last weekend, I had the opportunity to treat someone who regularly comes to Reiki Share. I was one of four practitioners working with this person. Usually during the beginning of treatments, we ask the receiver if there are certain problem areas that need more focus than others. But at the beginning of this treatment I was away, so I did not hear about the receiver’s problem areas. When I came back, the treatment had already begun; so, I quietly sat down and began to give Reiki. I was sitting on the left side of the receiver, so I placed my hand on the knee and the shoulder to balance the side of the body. After a few moments, I was very compelled to give Reiki to the receiver’s lower back. I slid my hand underneath the lower back and the other hand at the same location, but on the front of the body- above the abdomen. As I gave Reiki to this area, I felt pressure within my head, specifically between my ears. I also felt so still- that I did not and could move my hands to any other place. When I feel this pressure or that I am frozen in the spot, I know that position I am treating is exactly where the receiver needs energy. The twenty minutes passed by rather quickly. As soon as I knew it, the treatment was over. But what is most fantastic is that I was fortunate to speak with the receiver directly after. I was told that while I was away during the beginning of the session, it was revealed that work needed to be done on the second chakra. This was exactly where I was compelled to give Reiki! Wow, my intuition was what told me to move to the lower back. It was trustworthy , and I am glad I listened. Begin to listen to your intuition. You will only amaze yourself when you trust and respond to it. I just had to post this image because animals are very intuitive, especially cats. They love receiving Reiki and are great receivers when you want to practice. 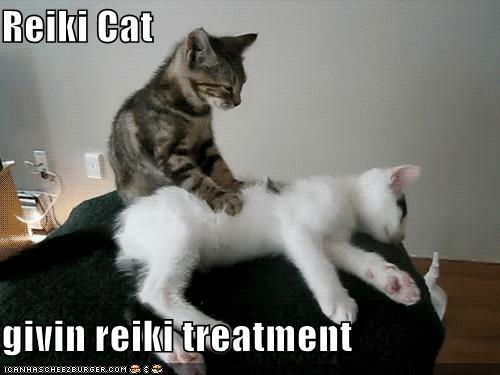 Who knows….maybe cats give each other Reiki, too. They just don’t let us see it. Every second Saturday of the month, I am blessed to belong to a Reiki group that opens its doors to the Public. On this day, anyone is welcome to come through the doors, lie on a massage table, and receive Reiki. It is located at the Unity Church, off Telegraph Road, in Bellingham, WA. You may drop-in between 1 pm and 5 pm. Each session lasts approximately 20 minutes. Cost is Free….but we do like to receive donations so that we can keep offering this service. If you are at all interested, curious, or have questions about Reiki, or want to watch Reiki treatments before receiving, please come. There is nothing but acceptance and love that fills the room. Come and try it, the least you’ll feel is relaxed and rested. For me, I try to live with Reiki and be aware every single day. Every morning, I say a personal dedication that helps me focus mentally and spiritually. Then I go to my busy, full-time job, and my mental focus is fantastic, but overshadows the spiritual energy. But, when I take my breaks or have a side conversation with co-workers, I find myself aware that the moment at hand is not work related, it is my time. So I take a deep breath, give my full attention to the moment, and appreciate it. 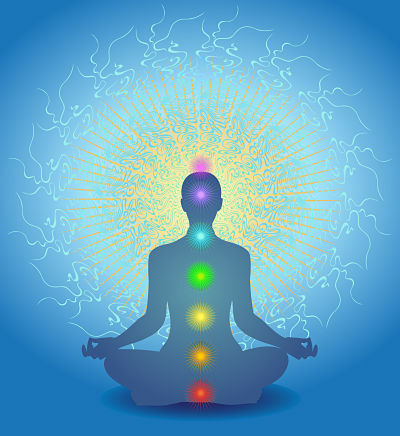 I feel calm and peaceful Reiki energy surrounding the interaction- a great balance to my busy work day. In our fast-paced society, be sure you choose to make moments for you. And then appreciate those moments you give yourself. It takes great power for a person to make time for themselves….and everyone deserves time to themselves.